Marinades, Dressings, Salsa, Ice Tea, Pop Corn, Wheat Puffs, Steak Sauce…… Cat food? I guess so, Paul Newman and his group of organic professionals must know what’s best for pets, and certainly they know it must be organic. When I saw the price tag at $1.99 per 5.5 oz can I thought to myself this stuff has got to be great tasting and totally healthy for this price. It is significantly more expensive than most every other cat food brand in the store; four times the supermarket brand my cat loves. Chicken & Brown Rice Formula for Cats was my trial selection for my cat. The chicken & Brown rice sounds like what I’d order from a Chinese takeout restaurant if I was on a diet. Formula, I have no idea what that could be? Now, at the end of the day, yes, I do feel better about buying something that is organic. But when you compare the ingredients to other cat foods produced by companies that only produce pet food products, I can’t see myself spending all that money for this brand. All in all, my cat ate the food. No, he didn’t run for it and meow like crazy when I open a can of his favorite beef variety from the supermarket. Then again, I wouldn’t get all too excited about chicken and brown rice either. 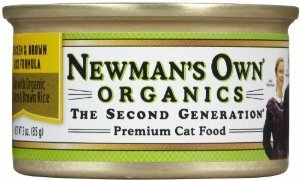 So, other than the price, I can’t really say anything bad about Newman’s Own Chicken & Brown Rice Formula For Cats, but I would recommend if you were set on buying this product for everyday consumption going to a good online retailer like Wag.com and buying it by the case for a big savings.